• Full, overlapping screen frame with charcoal-colored fiberglass mesh (full screen optional). • Meeting rails positively interlock for less air infiltration. Two locks on windows over 24” wide for optimum tightness and security. • Custom built for exact fit. • Fusion welded beveled frame and fusion welded sash. • Multi chambered extrusions providing maximum strength and efficiency. 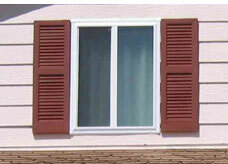 • Not mechanically joined or chemically welded like wood, aluminum or inferior vinyl windows. • 7/8 warm edge glass spacer – The latest technology in insulated glass. Reduces noise, reduces heat loss, reduces interior condensation and has a lasting appearance. • 3 ¼ multi chambered frame with sleek profile. • Positive action cam-type lock and keeper with dual locks on most windows. • Double weather stripping virtually eliminates air infiltration. 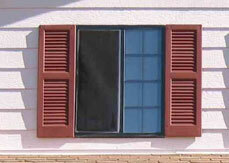 • Fiberglass half screens prevent insects (full screen option available). • Screens are easy to remove for cleaning. • Security latches allow safe ventilation.